There is so much to love about this story. The first woman pastor in more than a century at a Louiville church, after a short time leading the Unitarian congregation, “comes out”, in dramatic fashion as a member of the roller derby team from across town. 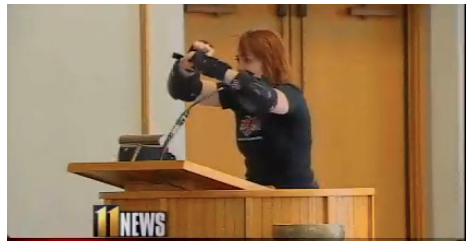 She is Pastor Dawn Cooley, also known as “Liv Fearless” of the Derby City Roller Girls. We are called to be fully us, I believe, as we worship in the way that we are called to worship. I love this story. Click here to view the video of this inspiring story. What an all around great blog!